Here's a question I'm sure you've asked yourself: what makes buffalo mozzarella different from ordinary mozzarella? As its name suggests, buffalo mozzarella is made from the milk of water buffalo. The reason that cheese producers like to use buffalo milk is because the buffalo's digestive process leaves more solids in the milk, which means more protein, fat, and minerals than cow milk. That means the producer can use a smaller volume of milk to produce the same result. As Wikipedia informed me, 1 kg of cheese can be produced from 5 kg of buffalo milk, whereas it would take 8 kg of cow milk. The buffalo mozzarella is less watery, and has a nice creaminess, which makes it perfect as a pizza topping. Although it is a typical and protected product from the Campania region of Italy, many other countries make their own version of the cheese, including Switzerland. 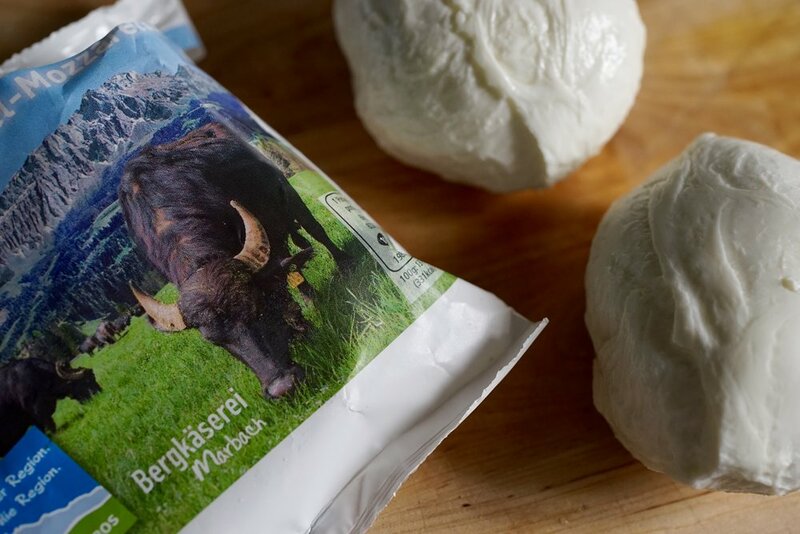 Just on the border of Bern and Lucerne lies the Bergkäserei Marbach, where in 1996 fifteen Romanian water buffalo were brought in to start milk production. Now their buffalo produce over 100,000 kilograms of milk per year and you can buy their products throughout the region, including at Migros throughout the city of Bern. Always looking for an excuse to eat an entire mozzarella ball in one sitting, I picked up a couple of packages from the Bergkäserei Marbach and made a fruity salad for the cheese to perch on. Arrange the lettuce on a plate, topping with a pleasing pattern of pears and figs. Place the mozzarella ball in the centre. Whisk together, then pour over salad. The proportions for the dressing are more like guidelines. Taste as you go, you can always add a little more mustard or lemon, depending on your preference. Once referred to as poor man's honey, this is a syrup of similar consistency made from pears. It is a uniquely Swiss product and can be used interchangeably with honey in most dishes, lending a markedly fruity taste.